WordPress page builder have emerged out to be highly beneficial as it is revolutionizing the trend of website development course. 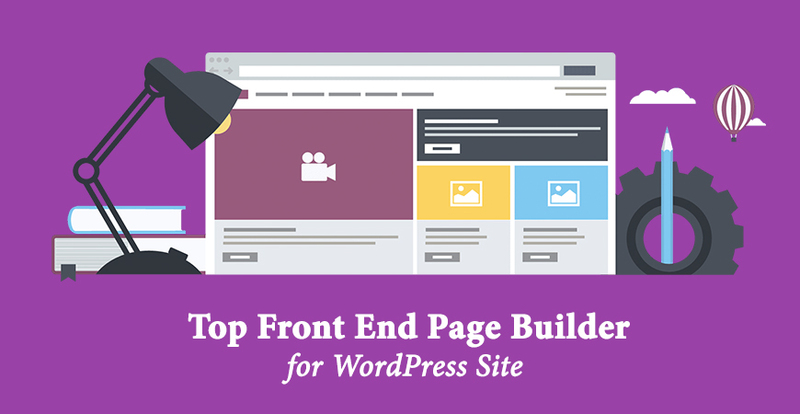 Be it beginners or experts, these WordPress page builders come in handy and allow them to create new website layout without using any single line of code. A WordPress page builder is an ultimate plugin that gives you the resilience for making modifications to the structure and design layout of the webpages with drag and drop editor. You can easily drag and drop the pre-made widgets in the content area, build alluring pages and rearrange them rather than writing codes. In such a way, you can design entirely distinct, exceptional pages than the default templates that are offered in the theme. A page builder offers an ultimate page editor that looks entirely distinct from the default post/page editor in WordPress. You no longer need to work with the ‘text’ view with HTML components or the ‘visual’ mode with a real preview of the content. Now, with the help of simple editor, you can easily add content blocks, pre-made widgets and components. In today’s scenario, the market is full of various free as well as premium WordPress plugin offering exceptional features. In this article, we will discuss about best page builder plugins for WordPress. One of the best drag and drop page builder that is ruling the market nowadays is Visual composer. Laced with ultimate features and functionalities, this page builder enables the users to style the content in the frontend or the backend. As the plugin is fully responsive and developer friendly in nature, all the content looks eye-catchy on mobile devices as well. More than 45 content modules are available in Visual composer such as post grids, charts, social media modules and many more. You can easily insert widgets into the content area that makes the possibilities of Visual Composer never ending. Moreover, anyone can style theme elements making use of the skin builder. Frontend and backend can be edited. Awesome selection of content modules. Inclusion of a flexible role manager and a shortcode mapper for third party shortcodes. Elementor is the most sought after solution when it comes to looking for a drag and drop page builder. Making use of this plugin, you can instantly design pixel perfect, high-end and fully responsive websites. This ultimate plugin comes with 28 outstanding widgets that serves as mighty elements for designing exceptional webpages. The plugin enable the users to utilize all the existing standard WordPress widgets as well as custom widgets that comes with the theme and other plugins. In addition to this, the plugin also enables you to utilize all the existing standard WordPress widgets and custom widgets that comes along with the theme and other plugins. Pre-designed templates to assist you get started. A fully mobile-friendly responsive design. In-built templating system which will support exporting and importing. Ultimate support for the pages, posts and all custom post types. Another time-saving page builder is Beaver Builder that comes with an array of opportunity. Bottled with several pre-built layouts and its variation, this WordPress plugin does not require any theme dependency or other third party software. Page Builder Sandwich is an ultimate premium front-end page builder solution that provide theme customization and content building features. This frontend editor simply adjust styling like text formatting, rows and columns. There are generally around a dozen simple content modules such as a carousel, table and newsletter. The best part is that the plugin supports widgets which showcases thousands of possible content options. Supported with WordPress widgets and shortcodes. Shortcode mapping all across the globe. Exceptional interface that showcases WYSIWYG editor all the time helping you to make quick edits. Pro version comes with 10 page templates and around 40 premade sections. Forge is a flexible frontend page builder that can be easily downloaded from WordPress.org. Featured with numerous responsive content modules like login form, pricing tables and featured block, this plugin comes with export and import functionality that helps in transferring content and designs between varied websites. Layouts can be exported and imported at anytime. With the help of pro version, pre made layouts can also be added. Aqua Page Builder is an awesome free page builder for WordPress. This page builder is highly popular among the developer because of its infinite number of template variation for professional utilization in WordPress themes. One of the exceptional feature of this page builder plugin is user interface utilized by the Menus and Widget admin pages. Numerous number of template variations. Live Composer is an ultimate drag & drop page builder that allows the developers to design pages making use of the frontend editor. You can see the main editor right at the end of every page. Using this plugin, you can easily style your page, insert modules, and save templates. Once you are familiar with such interface, you can easily create complex pages in no time. Completely free for using and downloading. Inclusion of more than 30 content modules. 10 pre-designed layouts equipped with plugin. The Themify Builder plugin is an ultimate flagship plugin by Themify Team. With exceptional features and functionalities, it let you to work with both front-end as well as back-end. Both the editing interfaces comes with a wide range of modules to select from and then dragging and dropping them on the canvas. The canvas is initially divided into rows which will be further divided into columns. Complete drag and drop support. Layouts can be imported and exported. Fully SEO friendly and translation ready. It has become the latest trend to make use of the page builder with WordPress theme developers and users. Nowadays, maximum themes come with inbuilt page builder integration and numerous widgets to work with it. With so many quality themes available online, it becomes a tough task to choose the best one. Currently, our themes are Visual Composer Ready – the top one with a lot of theme elements. With this feature, you can easily create a beautiful and unique WooCommerce website in just a few steps. Please check our Best Responsive WooCommerce WordPress Themes and enjoy them!